One of America’s top voiceover artists, Steve Morris voices television and radio campaigns for Yahoo!, Sprint, BMW, Chick-Fil-A, and Diet Coke. Welcome! Here, you can listen to Steve’s voice-over work, including the award-winning Ortho Fire Ant Campaign working with the delightful April Winchell, and their hilarious work together for Snow Summit and Bear Mountain. Have fun! Meet our 1940’s spokesman, Baxter McCambridge! 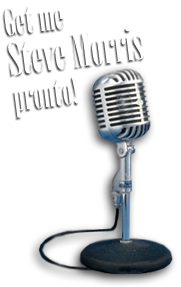 And of course, for commercial, promotional, narration or any other voiceover needs, get Steve Morris for your project! Call (310) 246-0945, or e-mail Steve here.